I have long held that there is one great name when it comes to direct to video horror, and that name is IFC. IFC has long brought out some of the best stuff around, and when they brought out Darkness Rising, I could do little but look forward to it. But would it live up to the high expectations this studio can muster? 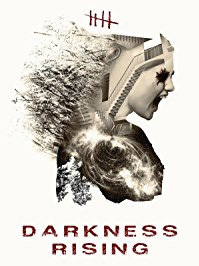 Darkness Rising features an unlikely confluence of events: a young woman's mother killed said young woman's baby sister, an event which left said young woman deep in the depths of grief. Said event also left the family home abandoned, and now our young woman has returned to said home before its imminent demolition. What's waiting for her there, however, is a lot more than she bargained for. A haunted house movie? From IFC? Featuring Heather Mazur AND Ted Raimi? How can this NOT win? That's the queestion I had to ask myself from go, because this is too big a potential win not to be at least kind of good. And indeed, we start right off with the fun stuff. Not only are there ghosts, but there's also a note of looting and treasure hunting going on, which is a personal favorite of mine. Personally, I'm of the mind that we could stand a few more "haunted houses full of loot" movies. Sure, it's not exactly as tense and potent as it could be, but it's delivering some decent thrills and a little punch besides. There are even some laughs, which is welcome in a haunted house film as a way to cut the tension in a way that doesn't involve jump scares. Not that there aren't plenty of jump scares too, but there's a choice, and that's good news. It even manages to neuter many of the modern technological outs a movie could face, like how you can't just yell out the window or call 911. I won't tell you how, but they do it, and with a certain note of plausibility. The ending is plenty bloody--fair warning to those who hate watching eyeball removal like I do, it's here--and a bit confusing, but it ends up reasonably well. Not the best ending, but still worthwhile. Special features include your choice of English or Spanish subtitles, audio options, and trailers for "The Survivalist," "Wakefield," "A Dark Song," and "Darkness Rising."